April | 2012 | ¡Permiso, Albania! Albania is big on coffee and yet surprisingly limited in their explorations of the many ways to drink it. Most all shops will serve you an espresso, but only a few can muster anything like a cappuccino or machiato, and these by traditional definitions are a bit off target. The majority of social and work gatherings happen over coffee so I’m not too surprised when I get back home and host-mom has had 5 already. If I offer to make it she’ll say Jo pime kafe. (lit. No, not drink coffee). So I’ll expect to be wired over the next few years, so as a celebration of the Albanian coffee culture, I’ve started taking pictures of each cup of coffee I drink. Here’s a small sample of what I’ve collected so far. Recently I’ve started to experiment. Also I snuck in a picture of Tripod, the three-legged cat. Misery loves company and I know from talking with my fellow cohort we’re all pretty much in the same boat. Pity the optimistic, happy ones. They get a lot of scornful looks. Still we’re not the first to go through it and our teacher Eri said that we’re all handling it quite well. Things to look forward to: In about two weeks we go away to the capital and then to the beach-side city of Durrës for a little R&R and to meet our future counterparts (the people in the communities and offices who will act as our liaisons on site). We will spend the rest of that week at our sites, which for me will be pretty easy since I’m here a lot already. Kyle (the current volunteer who I will be taking over for) has already talked about getting out of the city for a bit, thank goodness. So just a small hump to get over and certainly not the last, but if you are reading this drop a note and say hello and tell me how you are doing. What news from the USA? Puerto Rico? Any readers in Ireland? In Puerto Rico growing up my family would joke, especially on the weekend, about how that particular day would be their turn for a bath. I could imagine it in the days before electricity reached the high, isolated parts of Las Marias and Añasco, but I never thought I would have to live it. Many of the houses here in Albania work a little differently than those in the states. My own situation isn’t even that bad. 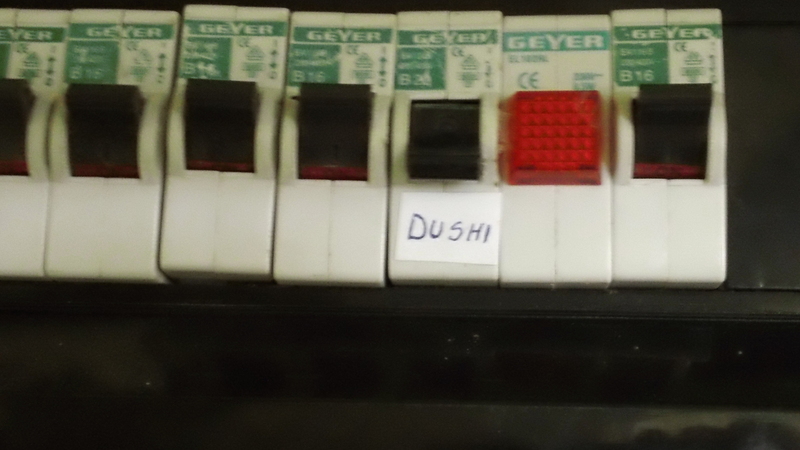 First I flip the switch on the fuse box, which gets the water heater going and after about 30 minutes, it is ready. In this house there is the one bathroom, which also houses the washing machine and one toilet and bidet (which for those of you who didn’t grow up with one, is for keeping your bits clean, especially in-between showers. Here it is sadly non-functioning). The shower is a hand held and despite the best corner huddling still splashes water everywhere. It sounds pretty simple, but it is quite an ordeal, so showers are limited to about 2 a week. Anything in-between is with freezing cold water. If the family showers more often, I couldn’t tell you. They are a whiz about keeping many of their movements and habits secret – either that or I’m completely oblivious (which is much more likely). I’m one of the lucky ones. Others rely on solar panels to heat the water, and during a rainy cloudy month like April, the opportunities are few and far between. Others are a bit more old school and have to heat their water on the stove and wash in a bucket. I’ve done it before and it’s not so bad except it’s winter-time and the windows are open. But some houses have the latest in scrubby-dubby including a shower door or curtain and in one friends place even a bathtub. Speaking with Kyle, whose apartment I may inherit when I move to Elbasan in a few weeks, he’s fortunate enough to have the option of showering everyday. Some other volunteers have embraced the challenges fully, even refusing to have their water heaters fixed. But as Paula, our lead Medical Officer said, if you can make life a little easier, why wouldn’t you? Here are some other pics from last Friday when they made the site announcement. Friday was the big announcement and I will be going to Elbasan. Actually staying in Elbasan, since about 2/3 times a week I’m either here or pass through. For the first 5 seconds after announcement I was a little underwhelmed to be completely honest. After hearing about all the different sites people had explored during the volunteer visit weekend, Durres, Korçë, Vau Dejes, Shkoder, I got one of the few places volunteers already know. Then I thought about it and I couldn’t be happier. Elbasan is essentially the hub of traffic for the Southern Region and quick hop over the mountain from the capital, Tirane. I’ve already started to explore the city and will fortunately be able to rely on the connection of current Peace Corps volunteers here and staff who will be my “in” to the community and hopefully getting a few steps ahead on future projects. And, with all the love in the world, I’ll be able to play host to fellow volunteers and other international passer-by’s. So, skippity-doo-dah. Not to mention it is a pretty great city (so I’ve been told – and hope to share my explorations with all of you soon). More details soon but I will be placed with the Municipal government. Yesterday during class we got the sad news that after 4 days of rain and cold a second cold front is on its way from Europe. April showers bring May flowers, but in Albania it brings cold weather y el hijo del Lole no le gusta el frío. For my friends who know me, this had to happen some time that I would complain about being ftóhtë (cold). It probably won’t be the last either and by next winter I will know the true meaning of cold. Every night I wrap my self in a cocoon of four heavy blankets. The morning routine begins with slamming the snooze button and dreading the moment I finally have to emerge, hardly transformed into something more beautiful. No two days are entirely the same, even in a sleepy rural town such as Thanë, but generally I start the morning with a cheerful “Mirëmëngjes,” from the host parents and Turkish coffee. Then it is a quick two-minute walk to school into the frigid classroom where our Thanë cohort go through the language routine, anxiously awaiting our coffee break. I get the feeling these next two years will be very stimulated. Alternatively we head to Elbasan where the day is divided between language and Peace Corps training related to our fields [Community & Organizational Development (COD) in my case], security procedures, and working with local population and handling the sudden flux of attention. This will be the true test of my spirit, as I’m beginning to learn that Albanians expect proactive attention. Marauding youth demand a response to their broken English (usually consisting of “hello” and curse words) but after only 3 weeks I’m still figuring out what is appropriate. Most are happy just to have a small conversation to appease natural curiosities. With others for now it is probably better to strategically retreat. These missteps and lessons learned I will be applying soon enough. This Friday we all receive our assignments and learn where in country we will be placed and with whom we will be working. The majority of COD folks will be placed in municipal bashkias, but not many hints or clues on geography despite my best sleuthing. Peace Corps (and everyone who has or is volunteering) has told us multiple times, “the experience is different for everyone,” and “you make of it what you want.” Fortunately I’ve had many great role models, most recently Corey from Group 14 Albania. Current trainees were sent across Albania to stay with volunteers from Group 14 and outgoing Group 13 to see what the experience is like first hand. I went north to the small city of Vau Dejes, just east of Shkoder. I’ll quickly side-track to say that Corey was an amazing host and as I said, a great role model. There wasn’t a day that went by that someone didn’t recognize him, or that we were invited for a coffee or chat. Despite the challenges of his site, he’s been able to meet some great and encouraging people and worked to develop projects, mostly working with youth and a local judo school. One night while gutting trout, I asked him when things finally “clicked” for him and he began to feel at home. Eight months, but even when he still didn’t feel at home, everyday he went to his bashkia, he spoke with people in the shops and in the kafe, he even started taking judo, and little by little (avash, avash) the language came, and the friendships were built. The relationships are of utmost importance. Everything in Albania of real importance happens over coffee, and it takes time and effort. So avash avash friends, the good things are worth it.